One of my mom's favorite films was The Negotiator. When she was sick in bed she'd watch the film over and over again. There was something about it she found comforting. I had seen the film when it originally came out, and many many many times in pieces with my mom. Recently I ran across the film on cable and feeling the need for little bit of violence I sat down to watch it. Seeing it again for the first time since my mom died I realized that maybe the reason mom liked it was that it's a damn good film. 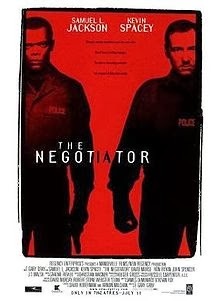 The Negotiator follows what happens when good guy Samuel L Jackson is set up to take the fall in a police corruption scandal. The Bad guys think it’s going to be an easy thing to do, but Jackson turns the tables by taking hostages and demanding answers. Things should be open and shut except that Jackson is the police force’s top hostage negotiator and he knows all the rules and all the games. Needing an ally he demands that the surrounding cops get another negotiator played by Kevin Spacey. The pair have never met which makes his inclusion in the mix questionable to the brass. As events play out the still shadowy bad guys take steps to make sure they remain hidden and Jackson ends up dead. What a great film. I don't think it makes any real world sense but in its own world its tense nasty, frequently funny film. The first thing you notice with the film is the cast. Never mind the the two leads, look at the supporting cast, Paul Giamatti (I believe this was the place he started to get really noticed), David Morse, JT Walsh, John Spencer, Ron Rifkin, Regina Taylor and lots of other familiar faces. This cast of stalwarts sell every minute so well you fall into it. Then there is the action. Set in the narrow confines of an office tower this is essentially one man surrounded by the world holding it at bay. How in the world with all the fire power arrayed against him can one man hold it all off ? You would think he couldn't do it but Jackson manages to do it. Granted it's huighly unlikely that any of this would happen this way, but at the same time its a blast to watch it. This is just a great great film and worth your time.